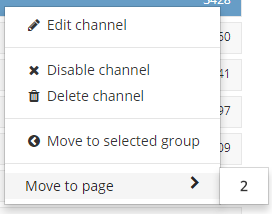 In the editor you can sort groups and channels with the mouse (drag & drop). Move the mouse over the symbol . Click and drag the record to the desired location. Then release the mouse button. You can also move multiple channels at the same time. Hold down the control (ctrl) button to select multiple records. Hold down the shift (shift) button to select all elements in between. If your list has multiple pages, you can move one channel to the other by highlighting the channel and clicking the right mouse button. Select on which side the channel should be moved.